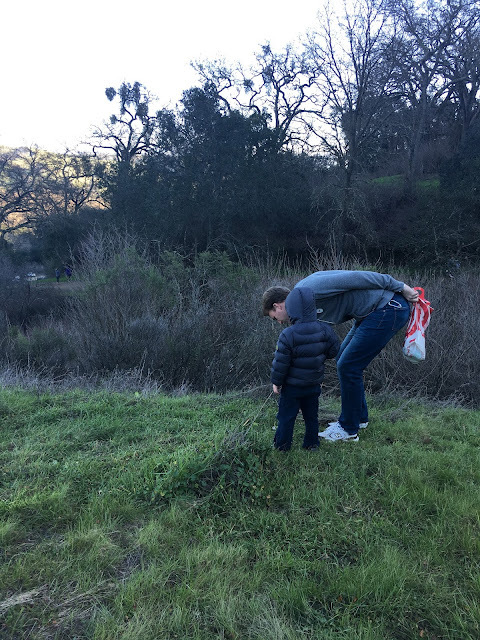 We love to get out in nature and go hiking! One of my pet peeves is when people LITTER in nature and our beautiful green hills and path ways are cluttered with trash! Often hikers don't even realize that trash has fallen out of their pockets as they have been walking. Trash can hurt animals and plants and also makes the land look gross! 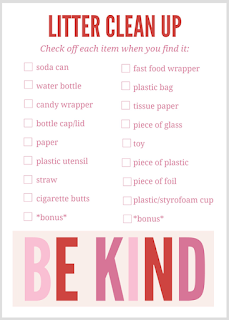 We kicked off our 100 Acts of Kindness Challenge this week and our first weekly challenge is a simple way to be kind to the environment. 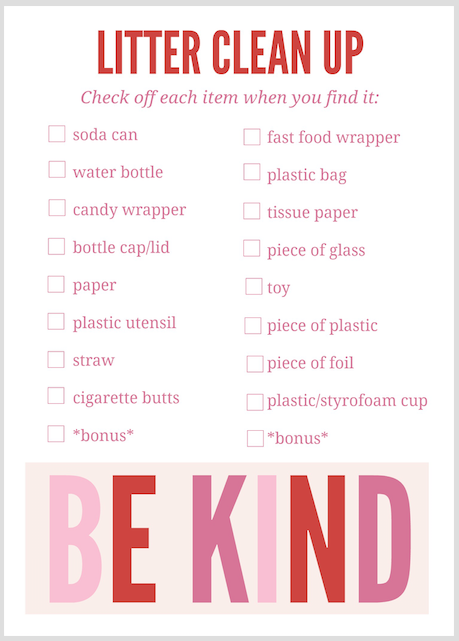 WEEK 1 KINDNESS CHALLENGE: We love finding simple ways to be kind to the environment! This week we are challenging YOU (and ourselves) to get out in the world and make it more beautiful by picking up litter! 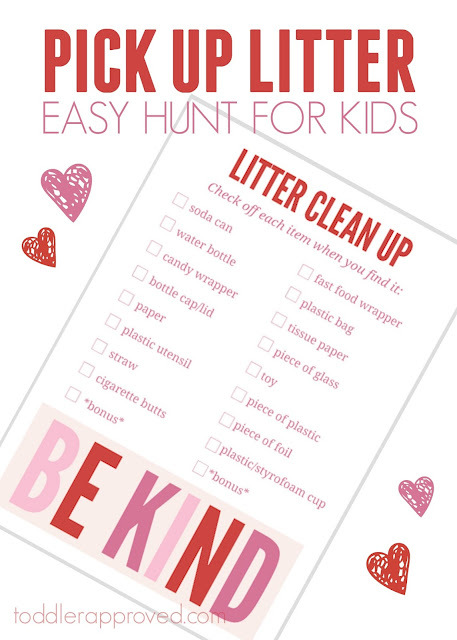 Print out our scavenger hunt printable and grab a pen or pencil. Head out somewhere in nature that you love! 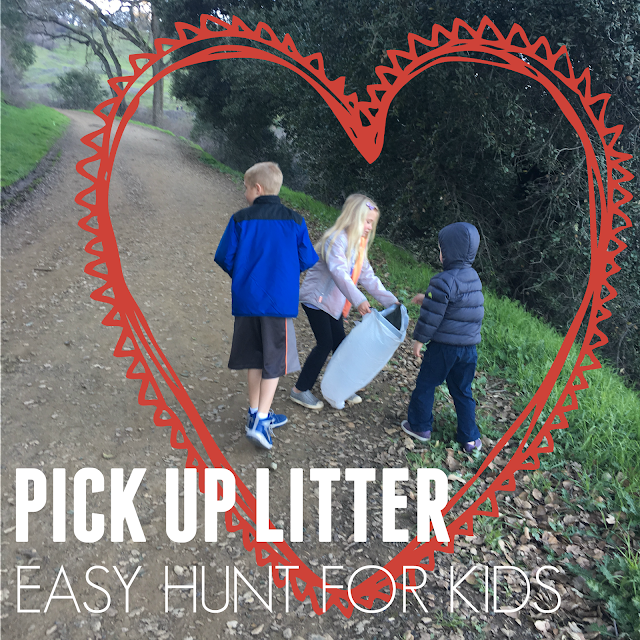 Using your gloves and trash bag, start hunting for litter. 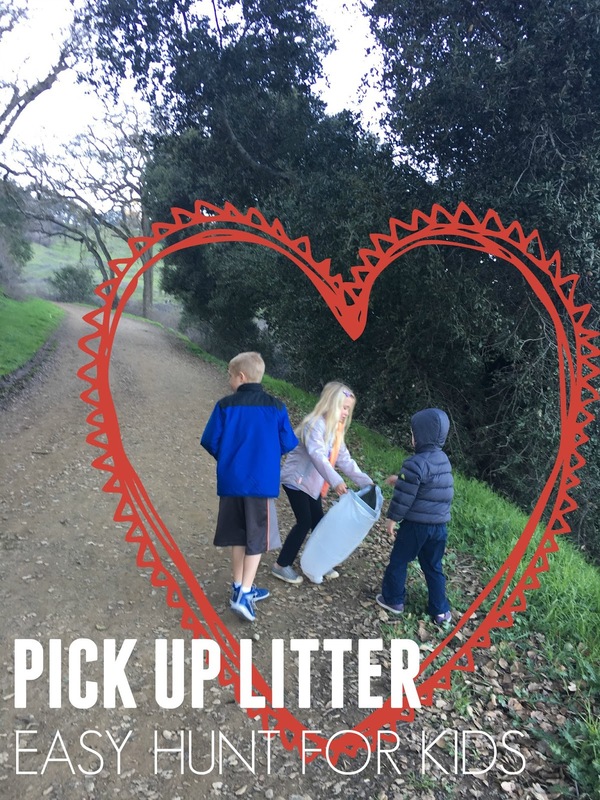 Pick up as much litter as you can during a specific period of time. Check off the types of littler that you find if any match with our scavenger hunt items. Feel free to write your own in as well! Once you've picked up a bunch of litter, go on a hike/walk and just enjoy the beautiful area that you just clean up! The animals, plants, and other hikers will thank you! Make sure you wash your hands afterwards!! You may have noticed in our photos that my kids weren't wearing gloves. They preferred to use skewers to skewer the trash and then drop it into the trash bags. They thought stabbing the trash with skewer was really fun. If you choose this route, just go over basic skewer safety first (ie. don't run with the skewer or swing it around). After our hour of hunting for trash I now see it everywhere! 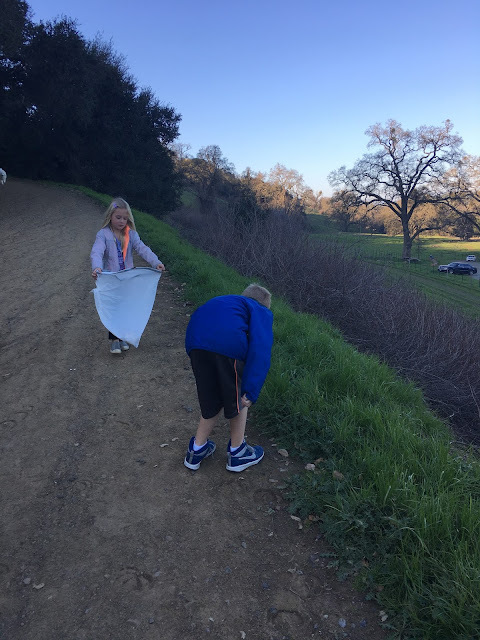 Picking up trash is such a great way to get kids thinking about their environment and being aware of what they do with their belongings. 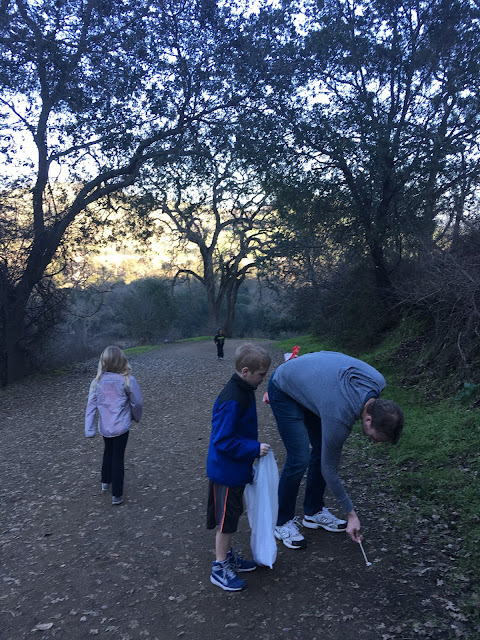 My kids were so grossed out by how irresponsible some people were on the trails that they even came home and cleaned out all of the trash from my car. They also wanted to start telling everyone on the trails to throw their trash away IN THE TRASH CAN! It was darling how this simple activity made them so aware and more conscientious. If you've ever gone on a trash scavenger hunt, tell me about it. What are the craziest thing you found? The biggest? Smallest? If you plan to join our 100 Acts of Kindness challenge this year, rush over and join our 100 Acts of Kindness Facebook group so that you can stay in the loop and see the fun things we have in store for you this year! Make sure you report back once you accomplish this week's challenge! We want to hear about how it went over in our Facebook group! Do you have any other ideas you could share with us to help accomplish this week's challenge? I really like this idea, what a great way to teach our children to be responsible citizens!